10%off for multiple weeks! Rentals that start before 7/1 are exempt from the new 12.45% lodging tax. 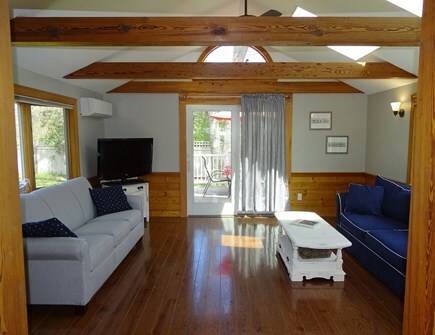 This adorable open concept 2 bedroom, 1 bathroom house is ideal for relaxing. 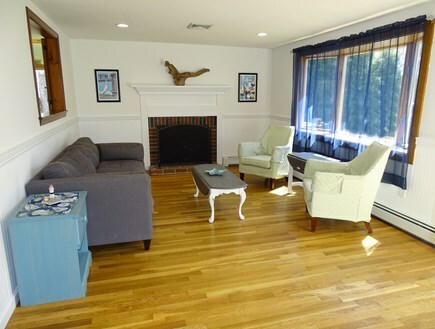 The front living room with a decorative fireplace, and back family room with comfy couches are connected by a spacious eat-in kitchen. This house has two decks, one in front and one in back, allowing you to enjoy the warmth of the summer sun over coffee in the morning and cocktails in the evening. 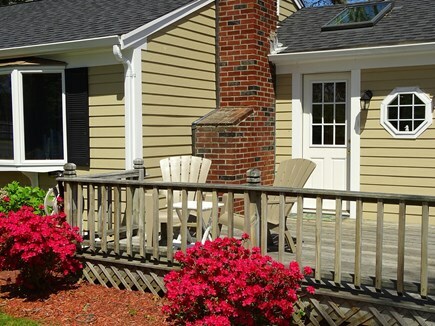 A ramp to the side door makes bringing your beach gear or stroller into the house a breeze. This home is located in a quiet neighborhood. 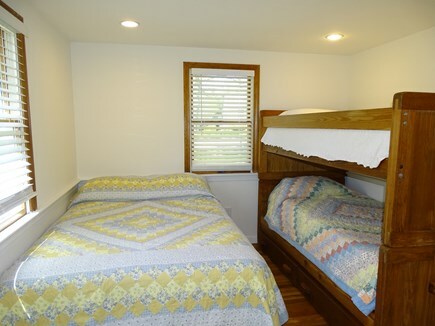 The master bedroom has a queen bed while the second bedroom contains a full bed and bunk beds. 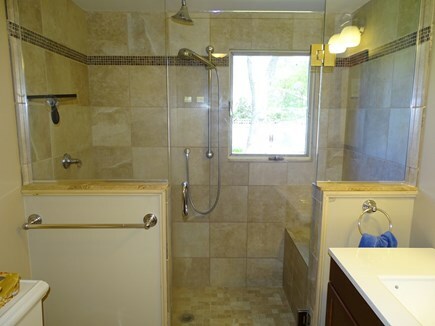 There are hardwood floors throughout the home and the bathroom has a stunning shower with multiple showerheads and built-in bench. 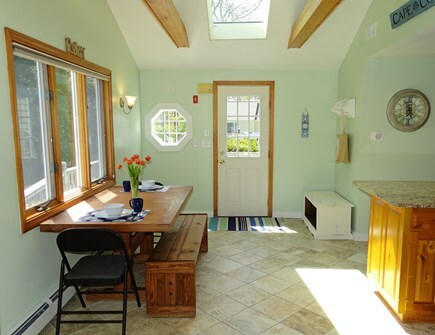 The renovated eat-in kitchen has a new gas stove and dishwasher, as well as a coffee maker, toaster, and microwave. 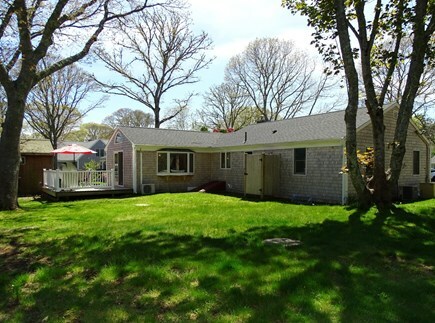 Enjoy breakfast on the front deck with a glimpse of the quiet pond across the street and decide which of Harwich’s several beaches to visit, all within a 5-7 minute (2 mile) drive. 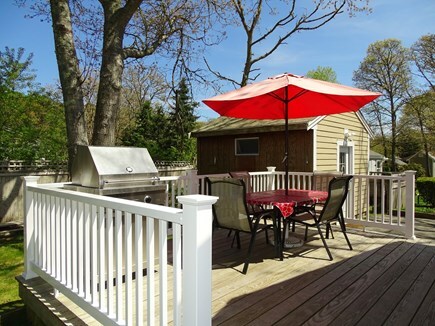 Finish your day with a relaxing outdoor shower and cook dinner on the Viking gas grill off the back deck. Take some time to explore Harwich Port with all its lovely shops and restaurants. The quaint town center is less than a 5-minute drive away (1.5 miles) with plenty of free municipal parking. This house is light and airy with the addition of several skylights, and you'll love having central air for those hot and humid days. High speed WiFi, basic cable and an Amazon Fire TV Stick allow for plenty of entertainment options. The house is also stocked with DVDs and board games for lazy days. The house has a generator hooked to the natural gas line, so no need to worry about power outages. Washer and dryer are located in the full, unfinished basement. Additional pricing info: 10% discount for multiple weeks, $100 cleaning fee, $250 refundable security deposit. State and local taxes of 12.45% will apply. A great house to feel right at home in! 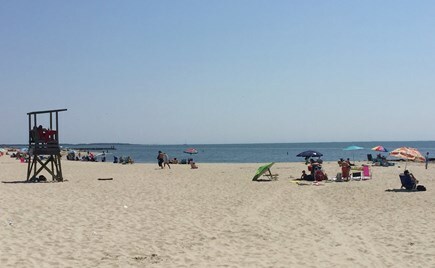 A nice neighborhood and close to great restaurants and beaches. 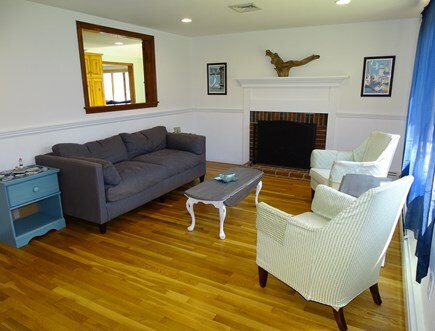 The house is newly renovated and so welcoming. There are two family rooms, two bedrooms and a spacious kitchen. Sundae School ice cream is around the corner and a must treat! Perfect place for a couple or small family. I highly recommend it! 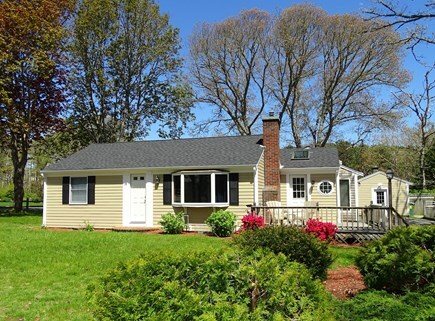 The owners of the property were very responsive to all inquiries and very pleasant to work with. We stayed at this home for a week with our two teenage daughters and loved every moment of it. The driveway was easy to access and the ramp makes it easy to wheel suitcases or bags into the house. The house is larger inside than it looks. 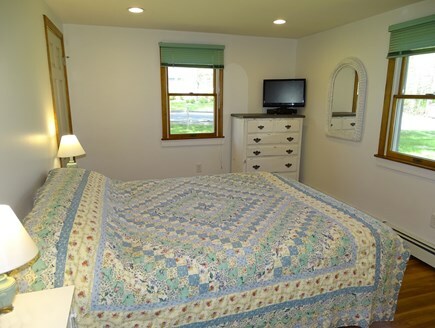 The bedrooms are a nice size and have comfortable beds. It was very clean and comfortable. 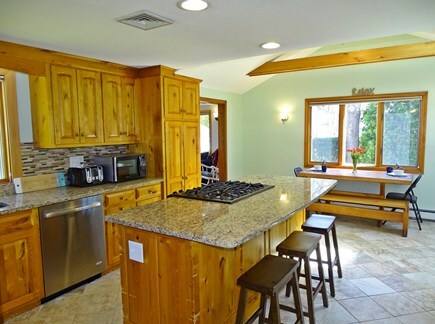 It had all the utensils and amenities you would need in the full kitchen. Plenty of space for the kids to play wiffle ball in the back and side yard. Wonderful deck off the very large family room that had a great selection of DVD’s, board games and an Amazon fire stick if you have an account to use. There are some nice extras like a cooler in the closet, sand buckets, frisbee, wiffle bat and balls. We live and work in Boston but we loved the Cape so much we had to have a base here as well. 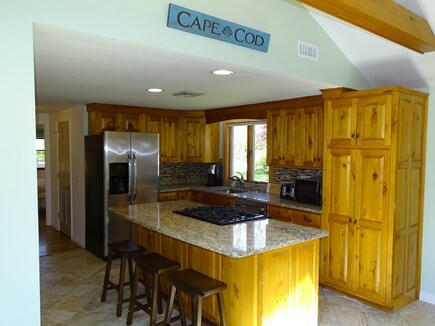 Much of our extended family still lives on Cape Cod. It's our home away from home!